Born in Boston in 1798, Warren was a musician and inventor in Cincinnati, Ohio before crossing paths with Welsh industrialist and social reformer Robert Owen in 1824. Warren and his family lived and participated in Owen’s experimental utopian socialist society of New Harmony, Indiana for two years before ultimately rejecting Owen’s cooperative social philosophy. Warren defined equitable commerce as a barter system where the cost of goods should be equal to the labor exerted to produce those goods, rather than the subjective worth of goods. 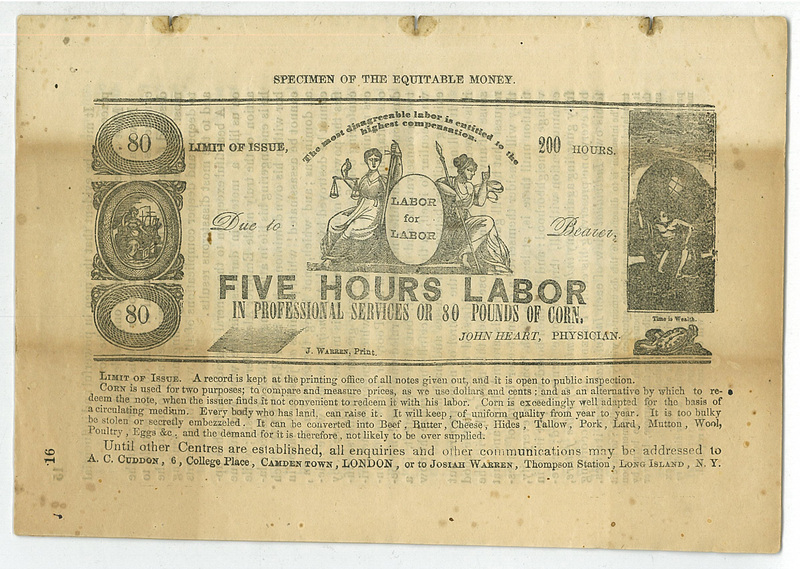 Instead of using cash for the purchase of goods, Warren advocated for the exchange of equitable money or “labor for labor” notes. 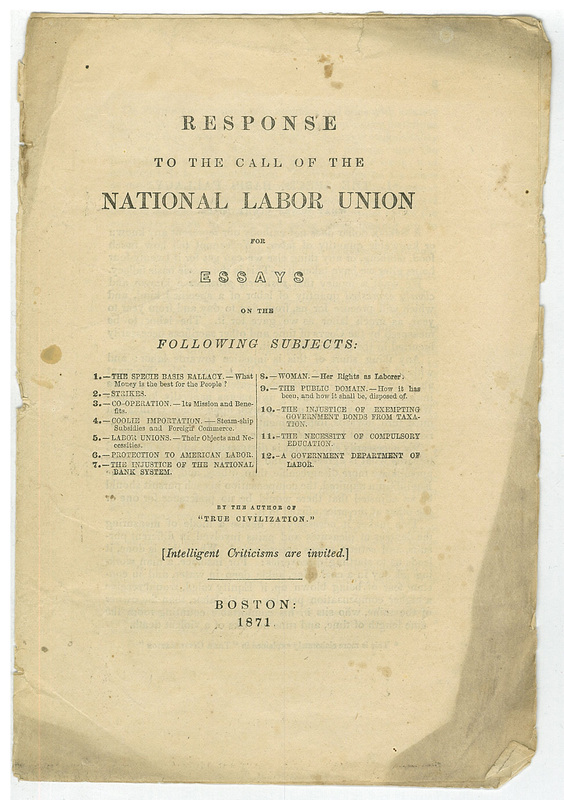 In 1833, Warren wrote and printed “The Peaceful Revolutionist,” asserted to be the first anarchist periodical. 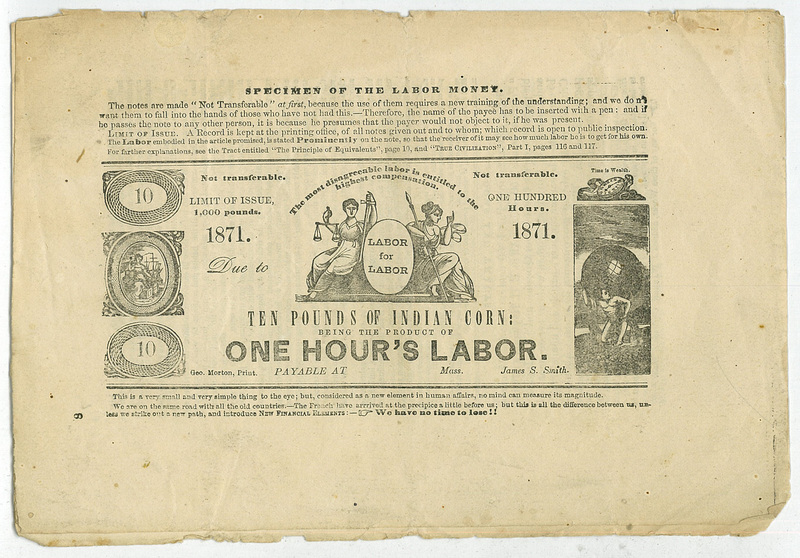 Warren’s objective to have total control over the printing of his publications, led to his invention in the early 1830s of the first printing press to print onto a continuous roll of paper, known as the “speed press.” Warren also cast his own type to use in the printing of his periodicals and pamphlets. In the early 1850s, with his philosophy of individualist anarchism and in collaboration with fellow anarchist Stephen Pearl Andrews, Warren established a new society on Long Island, NY named Modern Times. 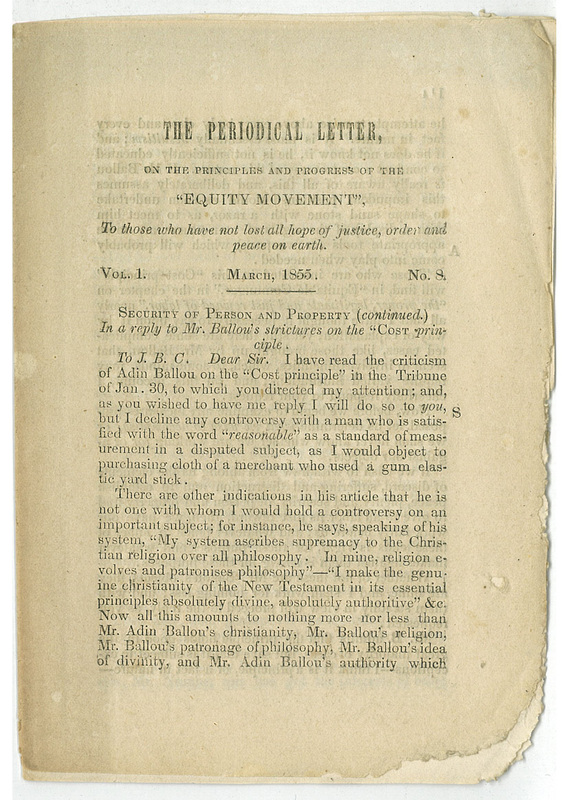 Although Warren’s Modern Times community quickly dissolved, Warren continued to publish numerous pamphlets espousing his philosophy. 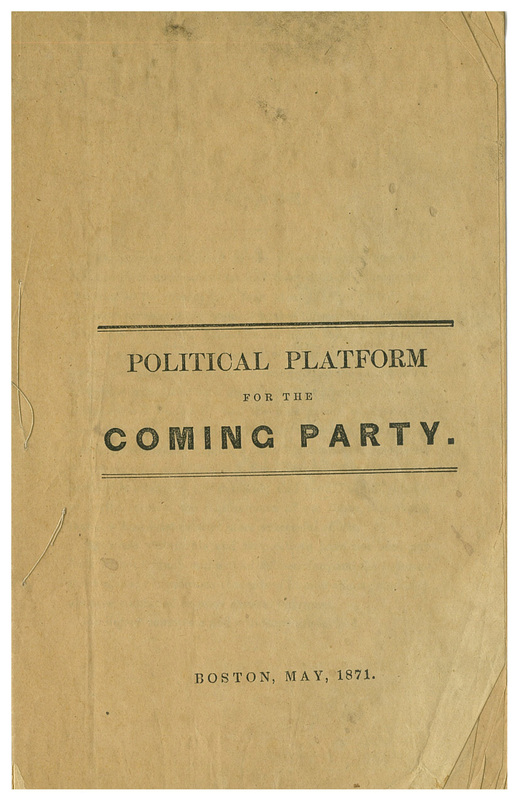 Four of these pamphlets are held in the Archives & Special Collections at Amherst College. Bailie, William. 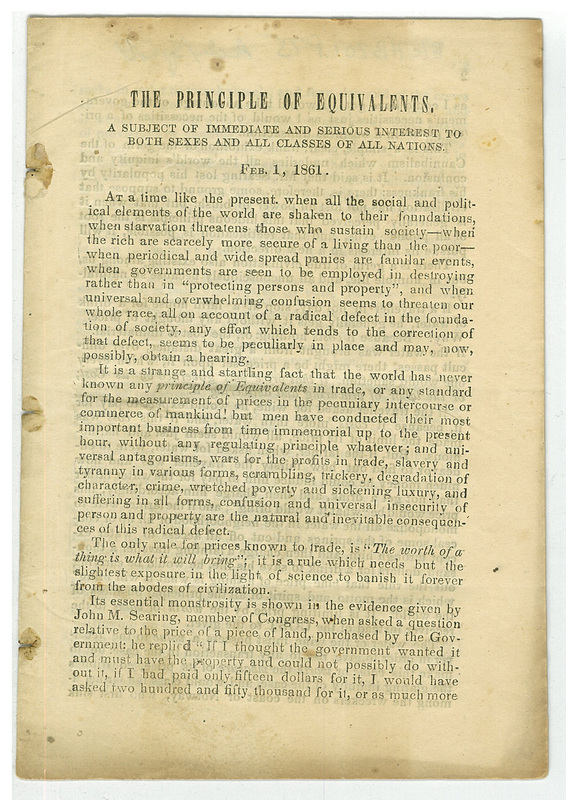 Josiah Warren: The First American Anarchist, A Sociological Study. New York, Arno Press, 1972. Butler, Ann. “Josiah Warren, Peaceful Revolutionist.” Thesis. Ball State University, 1978. Warren, Josiah, and Crispin Sartwell. The Practical Anarchist: Writings of Josiah Warren. New York: Fordham UP, 2011. 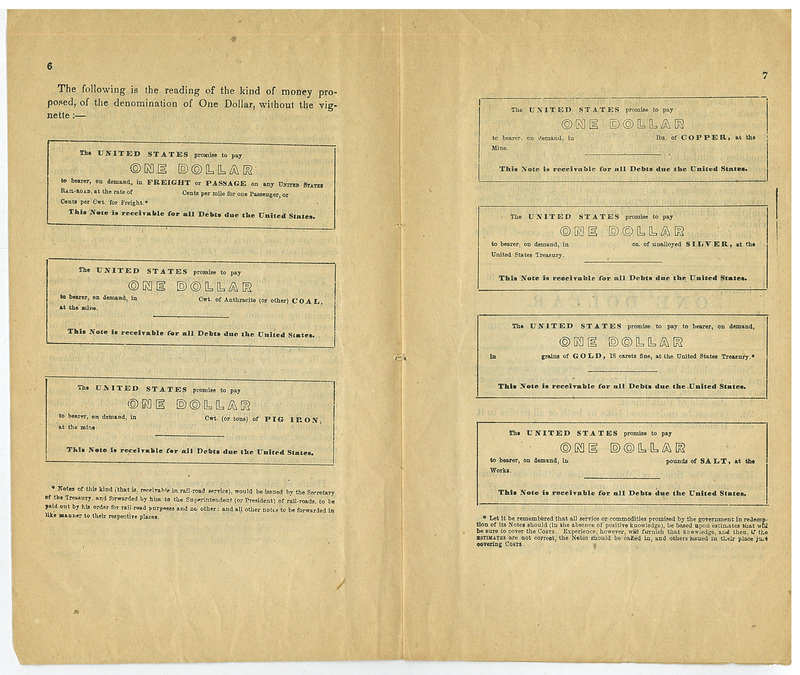 It’s a super interesting idea—but who get’s to print and distribute the bills? Seems like it would work in a true socialism where the government owned industry and could use something like this. It’s also interesting that this is essentially how bitcoin functions—except is the work of the decryption that gets one unit.